The mention of cement lorries shows an aspect of history that was once part of our own daily lives, and now banks are even a thing of the past, something which would have been unimaginable not too long ago. To present a complete picture of Alston Moor on the threshold of 1900, if it were at all possible, would need a lot more space than is available here in the Newsletter, so I hope this snapshot view will be sufficient to give some comparison of our life on the eve of 2000 with that of our predecessors of a hundred years ago. 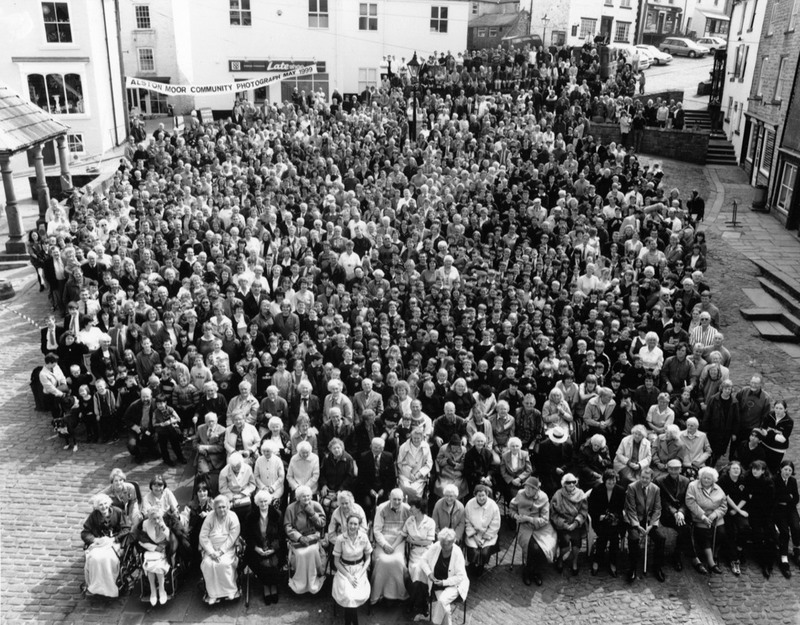 In 1899 the total population figure for the Moor had just levelled out after forty years of accelerating and dramatic depopulation, but even so, in 1901 the death rate of 3.19 per 1000 exceeded the birth rate of 2.23 per 1000. After this time the overall population remained fairly constant until the 1920s, when the closure of the last mine in Nenthead took its toll and led to another exodus. It is interesting to note that for many years the population of Nenthead exceeded that of Alston. Despite this decline, social welfare was improving. In 1894 the Alston with Garrigill Rural District Council had taken over from the old Rural Sanitary Board and greater ‘urban powers’ were at its fingertips following the Public Health Acts of 1875 and 1890, and the Public Improvements Act of 1895. Sanitation and public health were a priority, and water supplies and sewerage were being installed. For instance, in July 1900 a new sewer was being laid in the Butts in Alston, but a connection was not automatic, it had to be applied for. In 1899 some residents used to tip ‘night soil’ on open ground at the Fairhill and the Council could do nothing about it because it was on private land. The Medical Officer recommended ‘Public Ashpits’ be made available for all three communities of Alston Moor, with the introduction of a month’s trial of house to house collection. The council was more generous and recommended that the trial should be for six months. For rubbish collection the Council resolved that the lighting area of the town should be made a “Social Rating Area for the purposes of Scavenging”. Doctor Stuart Carson, the local G.P., was the Medical Officer for the Council and he had various powers, including the authority to condemn houses as unfit for habitation. This he did with four houses in the Butts in Alston. In 1898 he had recommended to the Council that all houses with byres or stables beneath should be condemned as uninhabitable, however, a decision was deferred. At the same time in 1898 he had reported his suspicions as to the purity of the water supply to the high end of Garrigill. A few other facts of life at the time were; that the Vieille Montagne Company of Belgium, which was based at Nenthead, was the main employer on the Moor. Its product of zinc ore was transported for a time by steam traction engines that hauled ‘road trains’ to the railway station at Alston for shipment to Belgium to be processed. Nenthead was soon to marvel at the wonder of electric lighting, courtesy of the VM company, which was not available to the public at Alston until the 1930s. Streets in Alston were gas-lit as they had been since 1843, while Garrigill presumably had nothing. The Greenwich Hospital owned most of Alston Moor until 1964, including the Market Place in Alston, where the market was held each Saturday. In 1901 the Hospital was willing to hand over ownership of the square to the Rural District Council, which it did soon afterwards. Although agriculture was completely overshadowed by the mineral produce of the area, it did exist. Agricultural Fairs were held in March, May, September and November, and the half yearly hirings about this time were all arranged to fit in with those held in Northumberland, not Cumberland. Illness was, of course, a concern for the whole community, not only for the family, but schools were often closed due to outbreaks of some epidemic or other. For example in 1901 Nenthall School had to be closed because of an outbreak of whooping cough and scarlet fever often raised its ugly head. Alston Moor was many miles from the nearest hospital and the construction of an isolation hospital was under discussion. The town of Haltwhistle (in Northumberland again) was approached to see if it wished to set up a joint hospital scheme. Ailments and poor sanitation were not the only threats to health and life. In 1901 the Council “resolved to call the attention of the police to cyclists riding down the (Front) street and round the corner at the Low Well (the junction at Townfoot), and to request them to take the necessary steps to have this dangerous practice stopped.” (!) This was long before the days of cars and cement lorries, the only traffic the cyclists were likely to encounter were horses and carts – and of course the pedestrians who were at risk from these joy-riders! Many of us witnessed the construction of a ‘workhouse’ in the Butts for the filming of Oliver Twist (in 1999), with the paupers seen to be breaking stones. Of course Alston Moor had its own workhouse, with only fourteen inmates at the turn of the century and an unknown number of others on day-relief. The workhouse was built in the eighteenth century and it is now Fairhill Cottages above the cemetery in Alston. In June 1902 the Rural District Council needed broken stone for works on the district roads and it resolved that the contract should be offered to the Board of Guardians of the Alston-with-Garrigill Workhouse, who would supply the stone at 3/- (15p) per cubic yard for stones broken by hand by the inmates of the Workhouse. The fiction was not far removed from the fact. For all the shrinking population of the area, Alston, Garrigill and Nenthead were still self sufficient in providing for the necessities of life. A walk down the street in any of the three communities would take you past the local blacksmith, the boot and shoe maker, the butchers, several grocers, the draper, joiners, builders and, of course, many more pubs than there are today. Garrigill had its own bookseller and stationer, Nenthead had its own glass and china dealer and an ironmonger. In Alston there were three stocking manufacturers, one of whom doubled as the Postmaster, two saddlers, four solicitors, four tailors (Nenthead had one), three watchmakers, three glass and china dealers, two corn mills, High Mill and Low Mill (since demolished), and, although not quite so far away as the headquarters of our local branch of the Hong Kong and Shanghai Banking Corporation, the same premises were occupied by the remotely based London, City and Midland Bank. The other bank was the Carlisle and Cumberland, where Barclays is now. Car fumes in the air and bubble gum on the pavements were not pollutants at that time, but – as it has been delicately put – “horse exhaust” on the streets was something to be avoided. This has been a very short review but it still sufficient to give an insight into a way of life quite different from our own. Have a Happy New Century!